The No.1003 and its big brother the No.1005 are wonderfully refined little drill presses and grand examples of North Brothers mfg. design excellence. The build quality is brilliant, probably among the best North Brothers mfg. produced, with a wonderfully smooth mechanism its a pleasure to use. Indeed this example is plague by few significant ailments, appearing to lack the gear tooth lose issue that ruins so many other of the company’s drills. 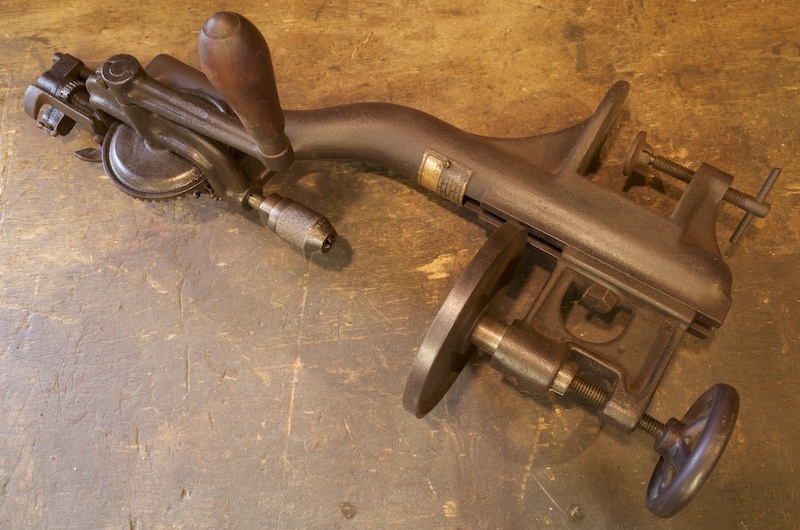 The only mechanical issues with this No.1003 is wooden crank ceasing up on occasion and the inability to remove the main drive gear or crank handle due to rust, the first of those can be fixed with regular penetrating oil to the base of handle. The No.1003 has a number of mechanical options selectable from 2 levers and a wheel on the underside. First of these is the spindle lock. In the horizontal position shown in the photo below the spindle will spin freely, allowing drilling. In the vertical however it will lock the spindle, this is useful for tightening and loosing the chuck with just one hand, as well and making it easier to get the chuck tighter. 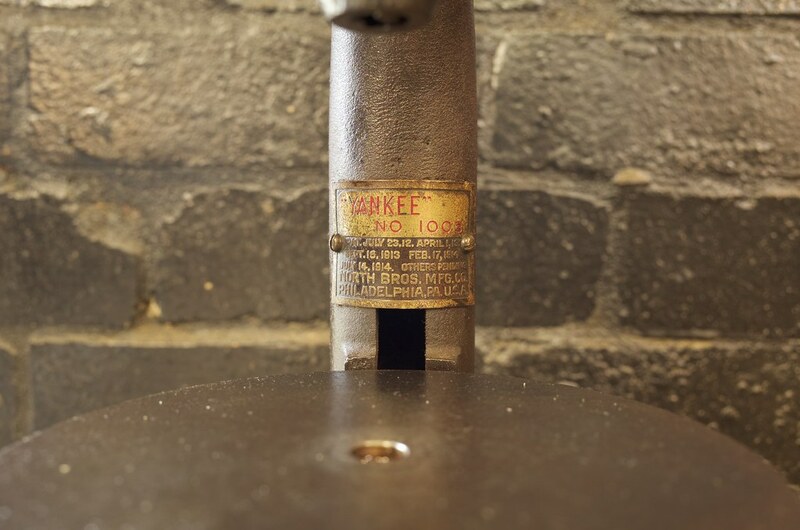 The second lever (shown below) controls the down-feed mechanism which is quite complicated. The Automatic ratchet feed is the most sophisticated part of the drill and a major selling point in its day. The purpose of the mechanism is to automatically apply the right amount of downward force, balancing drilling speed with not damaging the drill bit while not requiring a second hand to operate, thus leaving a hand free to manipulate the work. 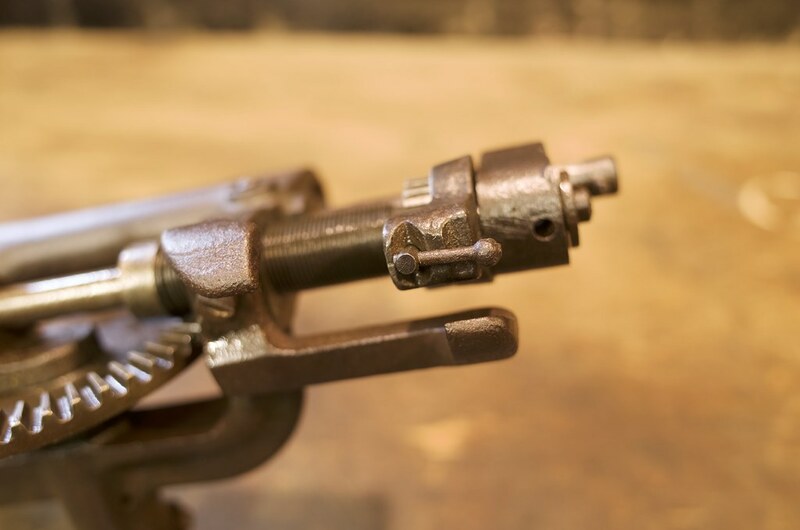 The mechanism is comprised of an eccentric cam inside a ratchet at the top if the feed thread. When the material is not resistant the the feed operates staring off the ball bearing torque control, however when the resistance increase it fully or partially switches to the ratchet, which then operates much like the cam base automatic advance system on larger bench or post drills. – Upward or Downward Vertical – downfeed will operate in both directions, going down if you crank clock wise (drilling) and upward if you crank anti-clockwise. – Left Hand Horizontal – Automatic ratchet feed engages downward, this is the mode that should be used for drilling, particular in metals. The feed cannot retract (move upward) in this mode. – Right Hand Horizontal – Automatic ratchet feed engages upward, it is unknown what purpose this serves, if any. The feed cannot advance (move down) in this mode. The part that juts out both above and below the automatic feed switches travel area serves the purpose of turning off the ratchet feed at these points to prevent the mechanism for locking itself up. There is also a torque control mechanism that works as part of the mechanism above. This mechanism can be likened to the screw driving torque control on many modern drill-drivers but for the Automatic down-feed. 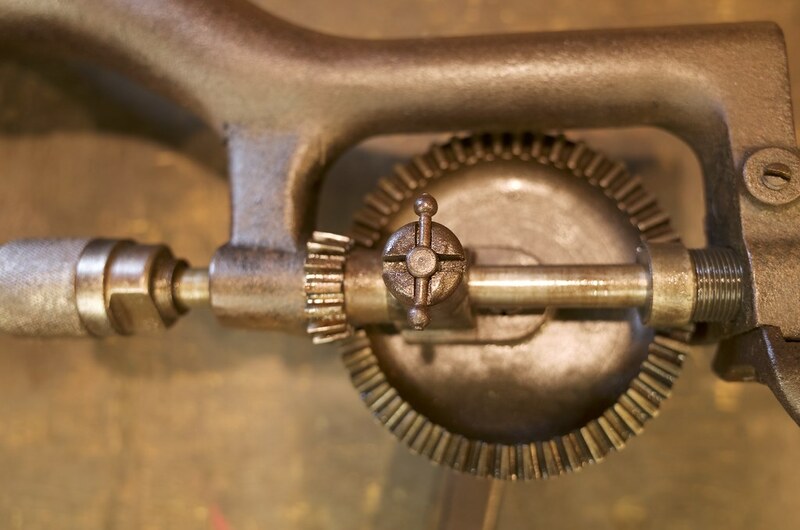 It is composed of a ball bearing (see first of 2 pictures below) inserted into a hole in the spindle with a spring behind the bearing so it can be depressed into the spindle with some effort. 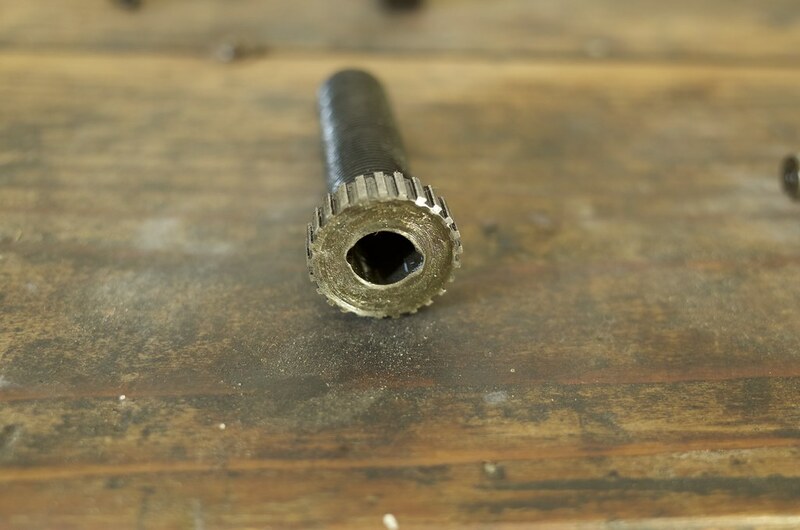 The bearing slots into a notch inside the down-feed thread (see second of two pictures below) essentially joining the two parts together and driving the down-feed. If the shear force exceeds a certain amount the bearing comes to of the notch allowing the spindle to rotate without the down-feed being engaged, the bearing will pass over the hole once per rotation of the spindle, if the shear force remains high it will continue to just pass over it, only dropping back in once the shear force drops (thus reengaging the down-feed). 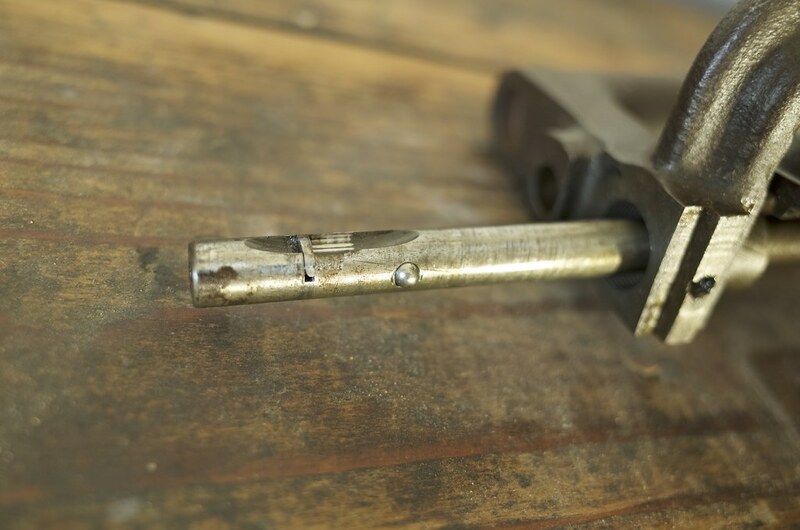 Note that the chuck is always engaged, the torque control only serves for the down-feed mechanism. 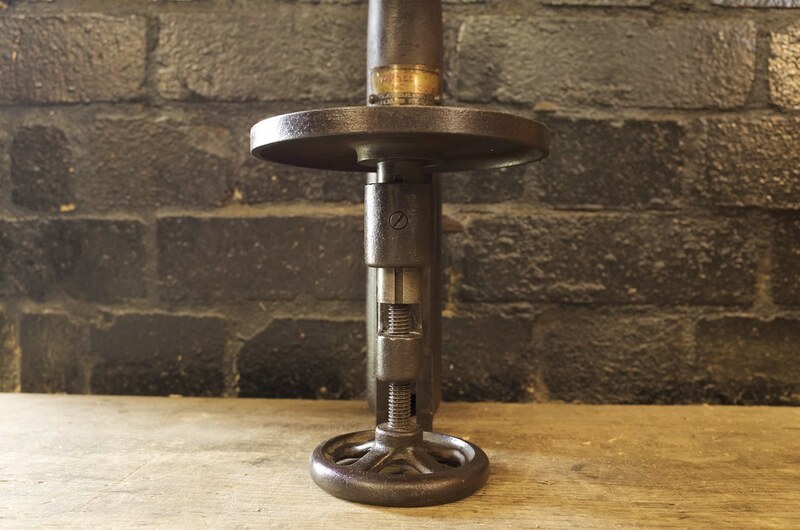 The wheel on the underside of the drill allows for fine adjustments to the table height, moving the table upward if turned anti-clockwise and downward when turned clockwise. 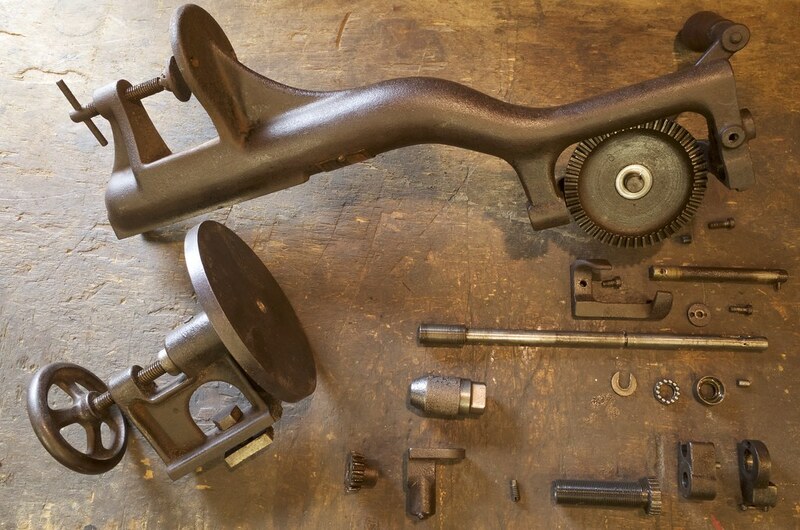 The entirely table assembly can be moved a much greater degree via the loosening of a nut and bolt that secure it to rails in the casting (this can be seen more clearly in the dismantled photograph at the bottom of the page). 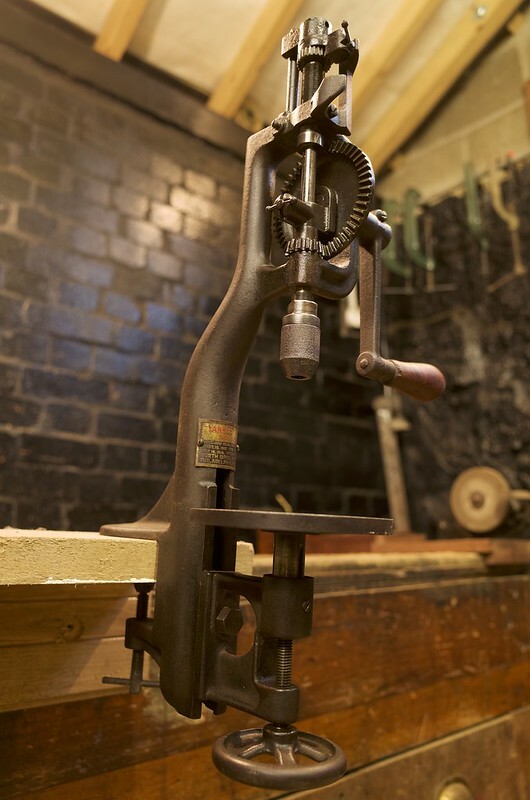 Overall this drill press is a superb piece of design in both form and function, being one the the best examples of what North Brothers Philadelphia were capable of. As a small engineering drill press the No.1003 really has no notable flaws. The heavy cast rigid frame makes the drill very stable and suitable for precision work, while not being excessively heavy and hard to move for a small drill. 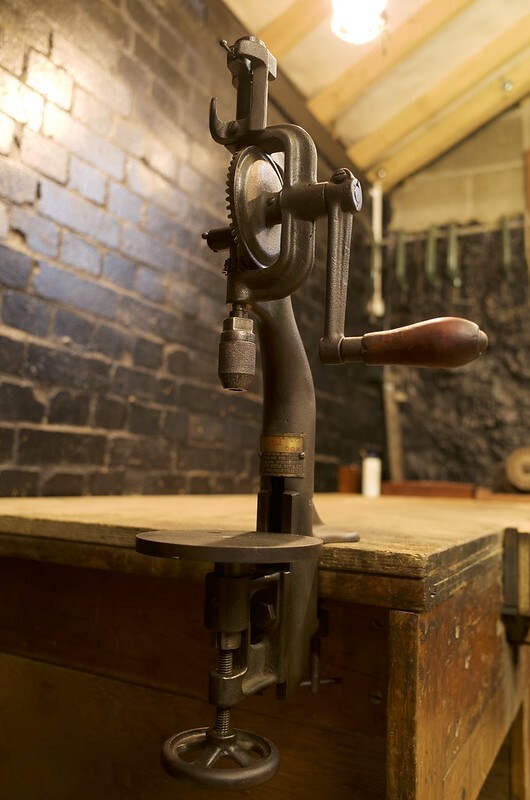 Indeed its rounded shape also make it surprisingly pleasant to carry about for a drill press. The automatic down-feed is probably one of the best of any manual drill press, hitting a rarely seen balance between drill speed, control and ease of cranking. Notes: Seized screws prevent the drive wheel and crank handle from being removed on this example.